As a free improviser, Marshall has performed with many Avant Garde ensembles in the Victoriaville Toronto Festival, Fringe Jazz Festival, Distillery Jazz Festival, at the Music Gallery, Artword Theatre, the Rex, the Cameron, the Idler Pub, etc. She has also been performing ‘spontaneous compositions’ in the Baker/Marshall Duo for many years with Thomas Baker (piano), creating 'in the moment' music through improvisation. This avant-garde duo has released two CDs: In the Moment and Chiaroscuro. 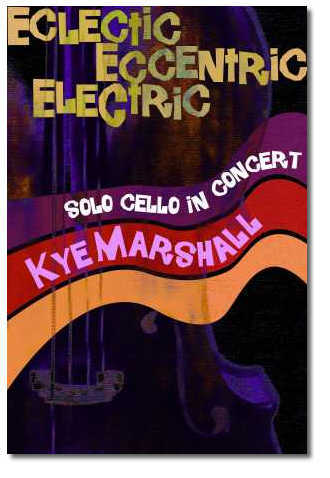 Kye describes the music she performs on solo cello as Eclectic - Electric - Eccentric as she draws on music of many different styes and cultures as well as her own experience as a woman in our society. She is able to achieve many different textures and layers by using some electronic gadgets like the 'boomerang' which help her loop tracks and create many different voices simultaneously. The aspect of improvising over pre-figured structures allows for a spontaneity, excitement and passion that is difficult to achieve with written-out music. One of the concerts that I perform consists of improvised com-positions whose nature and subject material reflects experiences of women. For example, one composition is entitled Housework and reflects the frustration, fatigue & relentlessness of this daily task; another composition is entitled Women in War and describes the courage & and valor of women against a background of horror; another composition entitled Swampland Serenade is inspired by the world of nature to which I feel deeply connected & which provides me with spiritual solace & musical ideas; & Hildegard is dedicated to the first known women composer in the Western world & draws on the musical style prevalent in her day.